Cat Quest hit the Nintendo Switch eShop early in the console’s life cycle, being part of a wave of RPGs to hit the system in the fall of 2017. 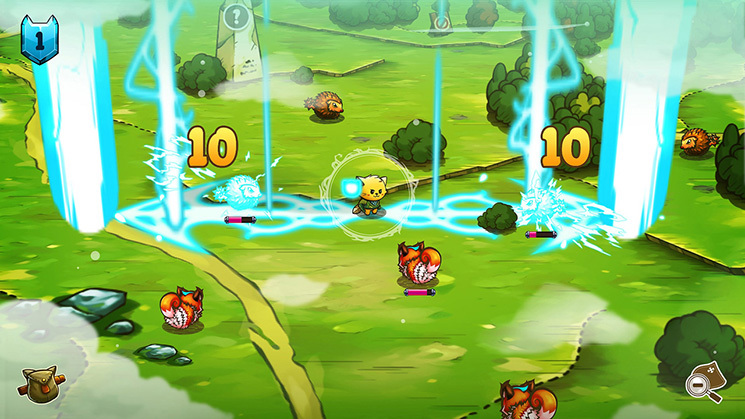 Recognizable for its gushingly cute artstyle, pun-filled naming conventions, and action-RPG combat, Cat Quest won the hearts of many, leading to a sequel which will be released later this year. I’ve recently had the opportunity to dive into feline-fueled quest, experiencing for the first time this furrific adventure. 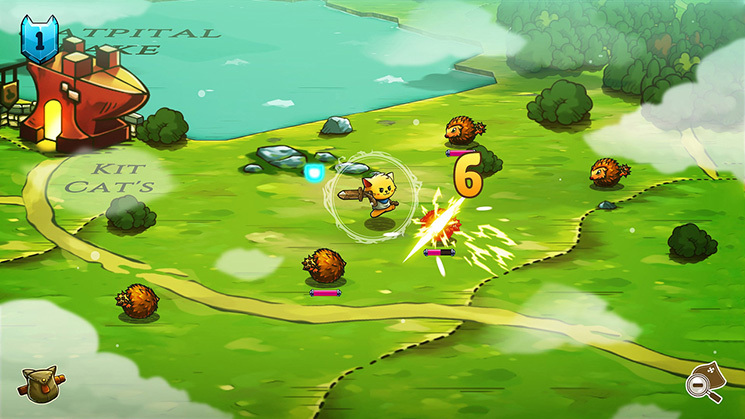 As noted, Cat Quest simply drips with the cuteness and charm. 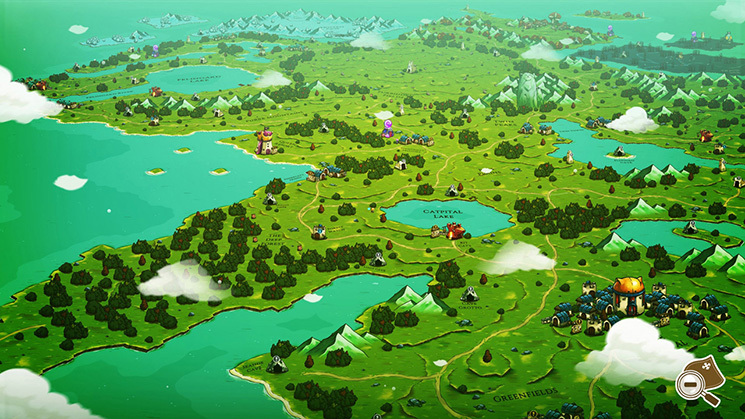 The main continent where the adventure takes place, appropriately named Felinguard, is filled with chibi-headed cats set against an epic fantasy backdrop. Each piece of geography in the game features yet another cat-based pun, from the large ‘Catpital’ city, to the mysterious ‘Ber-mew-da Triangle’. Pretty much every aspect of this game has been crammed full of cheesy puns and adorable artwork, leaving hardly any room from presentational subtlety. Thankfully, this full-on commitment to a theme works in the game’s favor, and I never found myself growing tired of all the new ways the developers found to increase the punniness. From a storytelling standpoint, Cat Quest follows a fairly straightforward path. The main quest opens with the protagonist’s sister being kidnapped by an evil cat named Drakoth. Washing ashore in southern Felinguard, our hero sets out to save her, joined by a helpful cat spirit who does all the talking for the remainder of the adventure. Very quickly, the protagonist discovers that he has a connection to an ancient magic called the Dragonblood, and he must stop Drakoth from reviving a forgotten race of dragons and plunging the world into war. While the main story of Cat Quest has a few twists and turns, it mostly follows a predicable course throughout the short adventure. The main questline sees the player traveling around Felinguard, diving into dungeons, slaying dragons, and gaining new abilities that allow him to pursue Drakoth. Over the course of the adventure, the player will learn to walk on water, gain the power of flight, and acquire an assortment of magic spells and equipment to aid them on their quest. Running alongside the main quest are a series of sidequests that can be picked up from bulletin boards at every town. Through these sidequests, the storytelling turns away from the predictable, choosing to continually subvert storytelling expectations. No sidequest is ever quite what it seems, as the hero finds themselves tricked, betrayed, or uncovering dark secrets at every turn. Through this sidequest system, the player not only gets additional opportunities to level up their hero, but they also get a closer look at the consequences of Drakoth’s misdeeds. You get the sense that Felinguard is a country truly thrown into disarray, and you are a hero who works not just in the background, but in the day-to-day lives of the citizenry. Experience gains in Cat Quest necessitate the completion of these sidequests. Repeatedly throughout the story, the player is encouraged to go explore the map and build up their experience before continuing in their quest against Drakoth. This progression turned out to be fairly well balanced, as I never felt underpowered going into any main story segment, so long as I took the time to do some sidequesting in between. Progression in Cat Quest occurs on two fronts. First, your hero gains experience through defeating enemies and completing quests. Each time the main character levels up, they gain a flat bonus across all character stats, getting generally stronger as time goes on. On the flip side, the hero will slowly collect equipment over the course of the game, each with their own unique mix of bonuses for given stats. Acquiring and upgrading new equipment allows you to build out your character as you see fit, becoming a walking tank, melee powerhouse, or all-powerful mage. Gold dropped by enemies can also be used to buy new equipment or upgrade your spells, further diverging your customization paths. If anything negative can be said about the progression system, it’s that you sometimes find yourself stuck using the same set of equipment for long periods of time – simply because its the best you have available. There are a variety of adorable outfits to choose from, but depending on your RNG, you may only get to use a small number of them over the course of your adventure. For example, I spent the majority of my adventure focused on a magic-based stat build, but never had a strong enough wizard hat to quite get the “look” of caster going for my character. Of course, all these game elements can only stand as strongly when placed next to the core gameplay element – combat. Melee combat in Cat Quest is a simple affair. At its most basic, players simply run up to an enemy, mash the attack button, and gather their loot when the enemy dies. Enemy attacks are broadcast through a red aura that appears at their feet, showing the range of their attack that slowly fills with a darker color before the attack triggers. The applies to both melee and magic attacks. The simple ebb and flow of combat involves diving in, attacking, and dodging out of the way before an enemy attack triggers. Magic combat, meanwhile, comes with a bit more variety. Each spell has a certain area of effect radiating from the hero, as well as some corresponding effect. The ice spell, for example, fires north and south of the hero and slows down by enemy movements and attacks. Meanwhile, the fire spell radiates out in a perfect circle, causing damage over time and making the enemy take more damage from melee attacks. Mix and matching your spells, equipment, and attack patterns can create a relatively predicable combat experience, despite the variety of options at your disposal. 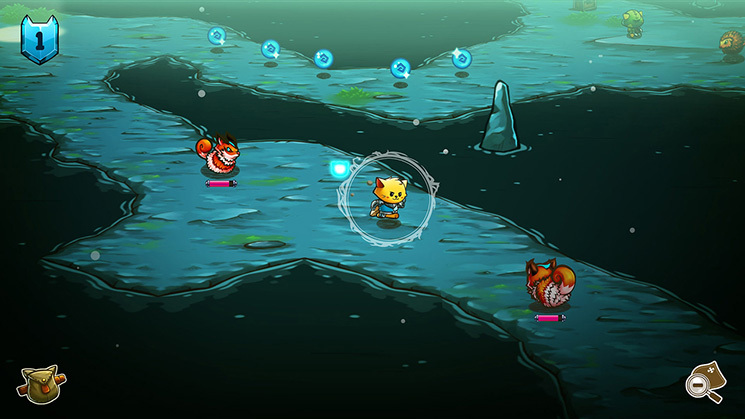 Cat Quest is, without a doubt, one of the most charming and adorable games in the eShop library. And while its combat system and core gameplay can become a bit repetitive at times, its storytelling and brevity still allow it to be an enjoyable experience from start to finish.